Orthopaedics is a medical science dealing with investigating, preventing and treating disorders of the motion system. The name is derived from the Greek word ”orhtos” which means erect, straight, and from the word ”paidion” which means child. The motion system comprises bones, joints and muscles. Due to a great number of anatomic structures orthopaedics includes a wide range of injuries, deformities and disorders that cause pain and trouble in movement. Orthopaedic surgeons use surgeries and non-surgical procedures to decrease or eliminate consequences of muscle-bone traumas, degenerative diseases, infections, sport injuries etc. The demanding sports rhythm or work on the one side, and lack of movement and recreation on the other, can cause a great number of problems that restrict our body in everyday activities. 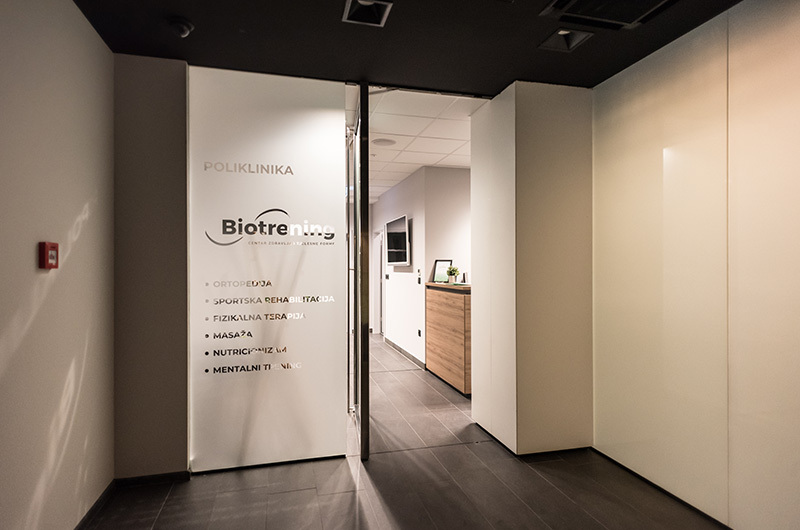 At Biotrening centre we perform examination and diagnosis of injuries and painful conditions of the entire motion system. Sport rehabilitation and manual techniques are led by our team of top physiotherapists and kinesiologists together with the best specialists in various medical areas (e.g. Dr Boris Nemec who is the official doctor of the Croatian national football team). All this is a guarantee that you will have the best treatment and service you can get in this region.